The Clint Eastwood vehicle A Fistful of Dollars, for example, is a remake of director Akira Kurosawa’s Yojimbo. Ditto The Magnificent Seven and The Seven Samurai, etc. 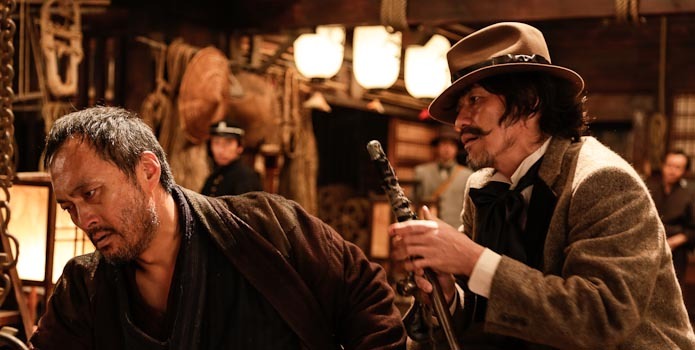 It’s therefore fitting that the western comes full circle with a Japanese remake of Eastwood’s definitive western. Lee Sang-il’s Unforgiven is just as good as Eastwood’s Unforgiven is, and it shows that the fluidity and border-crossing nature of genres and film language is alive and well. American remakes of Japanese films often feel like bastardized cash grabs, but this Unforgiven is a solid, no-holds barred take. Lee’s adaptation of the screenplay by David Webb Peoples remains true to the original and affords something new and exciting at the same time. (It’s much better than the Japanese Sideways, which turned pinot noir into merlot.) Lee Sang-il transfers the setting to Meiji-period Japan in a time of unrest as the Tokugawa shogunate has recently collapsed and the newly established government sees currents of change hit Japan, including migration and settlements by Ainu aborigines. The film’s hardened gunslinger also displays a mean hand with the samurai sword, as Jubei Kamata (an excellent Ken Watanabe) is an old cast-off from the Tokugawa Empire. Having since settled and fathered two children with an Ainu woman (now deceased), Jubei has left the old life in which he was a hard-drinking and murdering mean old cuss. He picks up his gun and blade, though, when hired to enact some retribution on a pair of drunken samurai clansmen who maimed a prostitute in a distant town. The violence he swore off comes back in full force as the westerner (or, in this case, easterner) rides off into the sunset to tame the lawlessness of the town in this time of change. The basic plot points of Unforgiven follow much of the original. 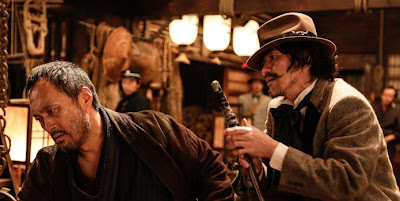 From the evil Sheriff (Koichi Sato, who does justice to the role that earned Gene Hackman an Oscar for the original) to the cowardly writer who pens the dime-store novels that form the foundation of the genre, this Unforgiven deviates little from the original, although it feels just as fresh. The inflections of Eastern codes of honour and tradition, however, shift the weight of some of the actions in the events that unfold. There’s more than just a bounty to be had in this gunfight. Lee Sang-il’s Unforgiven unfolds with the same visionary flair of the original. It’s one of the most breathtakingly shot films to screen at the festival—the cinematography by Norimichi Kasamatsu is a TIFF highlight as it transforms the barren plains of the west into snow-flaked towns and forests captured beautifully in the rising sun. The production value is beyond what most remakes enjoy in the hands of Hollywood’s biggest studios, as is the added zest of violence that inflects the film. Lee’s finale is especially memorable, as it brings a jarring bit of explosive violence to the slow burn that precedes it. A standoff not unlike pistols at dawn, the end of Unforgiven is a mix of gunplay and crossing swords. The way of the samurai and the way of the westerner go hand-in-hand as ever they did before. This bold new take on Unforgiven is one hell of a film.